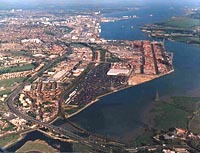 Owned and managed by Associated British Ports the Port of Southampton on the South Coast of England is one of the largest and most diverse ports in Europe, handling 55,000 commercial vessel movements and 34 million tonnes of cargo each year. As well as being a World-class hub port for containers and new vehicles, Southampton handles a wide range of other trades including cruise ships, grain and agribulks, fruit and fresh produce, liquid bulks and project cargoes. Thanks to the presence of a large oil refinery at Fawley, together with an oil terminal at Hamble, the port is also a major handler of tanker traffic. Estimated to provide around 10,000 port related jobs in the area, the port's prosperity is of considerable importance, not just to the regional economy, but to the UK as a whole. In addition to its varied commercial activities the Harbour Area that includes the Central Solent, Southampton Water and the Rivers Test and Itchen is a haven for yachts and leisure craft, and ABP strives to preserve the safety of all users including recreational boat owners as they sail the waters of the Solent . The harbour plays host to international events such as the Whitbread and Global Challenge yacht races, Cowes Week and the Southampton International Boat Show. Home to around 2,500 recreational berths Southampton has Marina's with visitor facilities at Hythe, Town Quay, Ocean Village, Kemps and Shamrock Quay.